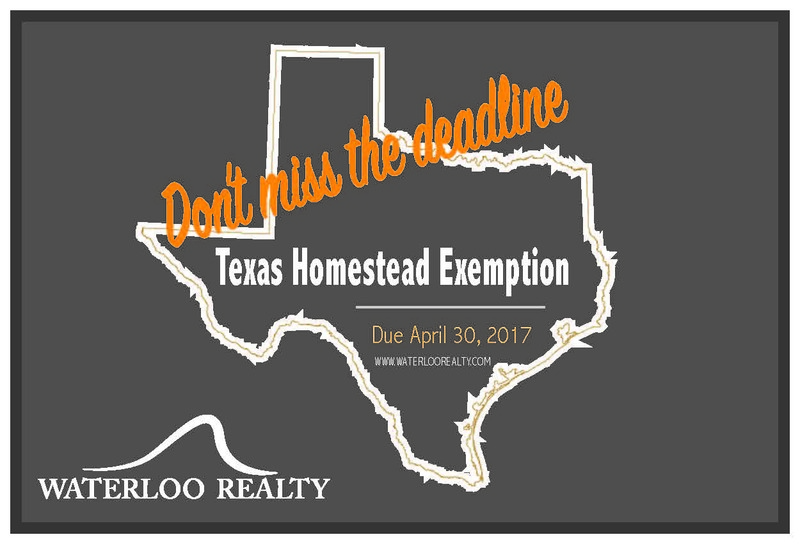 Don't forget to file your Homestead Exemption! For example, your home is appraised at $100,000, and you qualify for a $25,000 exemption (this is the amount mandated for school districts), you will pay school taxes on the home as if it was worth only $75,000. Taxing units have the option to offer a separate exemption of up to 20 percent of the total value. There are several types of exemptions you may receive. School taxes: All residence homestead owners are allowed a $25,000 homestead exemption from their home's value for school taxes. County taxes: If a county collects a special tax for farm-to-market roads or flood control, a residence homestead is allowed to receive a $3,000 exemption for this tax. If the county grants an optional exemption for homeowners age 65 or older or disabled, the owners will receive only the local-option exemption. Age 65 or older and disabled exemptions: Individuals age 65 or older or disabled residence homestead owners qualify for a $10,000 homestead exemption for school taxes, in addition to the $25,000 exemption for all homeowners. If the owner qualifies for both the $10,000 exemption for age 65 or older homeowners and the $10,000 exemption for disabled homeowners, the owner must choose one or the other for school taxes. The owner cannot receive both exemptions. Optional percentage exemptions: Any taxing unit, including a city, county, school, or special district, may offer an exemption of up to 20 percent of a home's value. But, no matter what the percentage is, the amount of an optional exemption cannot be less than $5,000. Each taxing unit decides if it will offer the exemption and at what percentage. This percentage exemption is added to any other home exemption for which an owner qualifies. The taxing unit must decide before July 1 of the tax year to offer this exemption. Optional age 65 or older or disabled exemptions: Any taxing unit may offer an additional exemption amount of at least $3,000 for taxpayers age 65 or older and/or disabled. Last updated April 20 at 4:11 am.